Adventures by Mom - Page 5 of 5 - Everything you need to know, but nobody tells you about when it comes to motherhood, marriage, and life in general. 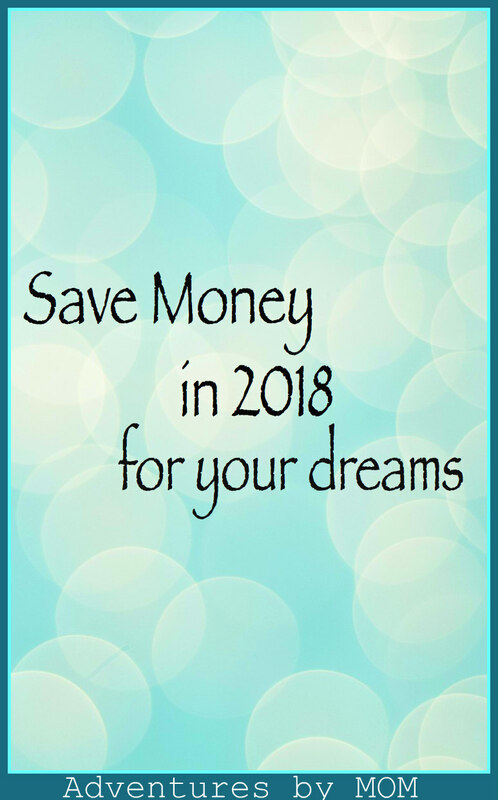 Is saving money is on your list of things to do in 2018? If so, you aren’t alone. To save money makes the Top 10 list of New Year’s Resolutions every single year. The first order of business when it comes to saving money is to examine your spending habits. Once you figure out exactly where your money is going, then you can make adjustments to save more of your hard earned cash. So, first take one month to write down everything you spend. Every day just jot down on a calendar what you spent or any money you received. At the end of the month add up the amount you spent. You might see a pattern and a place where you can save money. I just HATE to cook. Honestly the cooking gene in my family just skipped right over me. It just seems like cooking is not an effective use of time! LOL! But when I learned that the average American family spends over $3,000 a year on eating out I decided to take a closer look at my habits. CLICK HERE for some cheap, healthy and delicious recipes! Ok, shame on all of us for food waste. It really is a huge issue and Americans actually waste more food than any other country in the world. As much has 50% of all produce in the US is thrown away – $160 BILLION of food every single year. That equals about $1600 per family WASTED. Let’s step away from that horrible statistic and move closer to eating that food and keep it out of the landfills AND keep that money in our wallets. Plan Ahead – I won’t lie. I hate this part. I hate knowing that Thursday I have to cook chili. What if I don’t feel like cooking chili on Thursday? OK. I know that is super duper selfish of me. I’ll make myself grow up if you will! So, plan the week’s menu. It helps me if I just think it terms of the week and then choose the day I end up cooking the chili. 2. Stick to the plan! If you bought enough bananas to put one in everyone ‘s lunch every day, then stick to the plan and put a banana in everyone’s lunch every day. Otherwise the bananas will rot and then be put into the black hole of the freezer purgatory where they’ll wait to become ……banana bread. Banana bread, which you and I both know, you haven’t baked since 1992 back when your metabolism worked properly. So, the slimy, but now frozen, bananas will take up freezer space for about 12 months till you toss them out to make room for newer, fresher, slimy rotten bananas for the banana bread you won’t be baking this year either. So, let’s just skip all that nonsense and just give everyone a banana for lunch. Save Money – Watch your Drinks. I hate the ‘non’ water, don’t you? My kids hate the non-taste of water, don’t yours? All the things you drink instead of plain, boring water is costing a fortune. Don’t believe me? Go back to month one where you wrote down all your spending to see how much of your hard earned money is going to drinks. I think you’ll be as surprised as I was! Step 1 Coffee and Tea on the go. Yes, we are talking about your Starbucks habit. I’m not saying that your morning ‘half-calf, tall, vegan latte with 2 pumps of caramel, 3 sprinkles of cinnamon and 1 ice cube” is not worth the money. Just be aware of how much money you are spending on it and make sure it is worth it! Step 1 – BYOC – Bring Your own Cup – Sometimes places will give you a discount on coffee and tea if you bring your own cup. Einstein Bagel’s is one business that will! Make your coffee and tea at home. Learn how to make your fancy schmancy coffee recipe at home and take it with you. Cut back. Consider coffee purchased at a place like Starbucks as a treat and not an everyday thing. Step 2 – Buy a refillable water bottle. Refillable water bottles are everywhere. Buy your own to refill FREE from water fountains everywhere. Small packets of flavoring are cheap, lightweight and easy to carry around. These make super cheap drinks for the whole family. You can save a ton on drinks this way when you travel. When we were in Turkey and only drinking bottled water, flavor packets I brought from home really made the kids happy! When you do spend money to eat out, make it go as far as possible. Step 1 – Watch the time. Some menus have early bird specials. Lunch is usually less expensive than dinner, too. Watch your mailbox. You can get coupons through your snail mailbox and your email inbox. New restaurants often drum up business with coupons. See if your favorite restaurant has a loyalty program by checking out their Facebook page. Groupon has some amazing deals, too! Step 3 – Cash or Charge? Carefully choose your payment method. Sometimes you get a discount with cash. Certain credit cards give points for purchases, too. Watching your savings add up is fun because you can see yourself getting close and closer to your goal. Here are some great ways to watch those savings really add up! Plan 1 – Save $1 a day. Each day add $1 to the amount. It gets harder at the end of the month when you are saving $30 a day. Coming Soon – the Save $1 a day worksheet. OR Save $1 a day – every day. You will be shocked at how this adds up! CLICK HERE for the math if you save $1 every day. 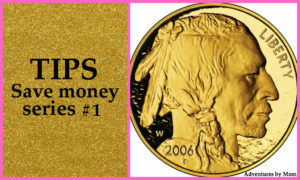 Plan 2 – Save coins. Plan 3 – Pay yourself. 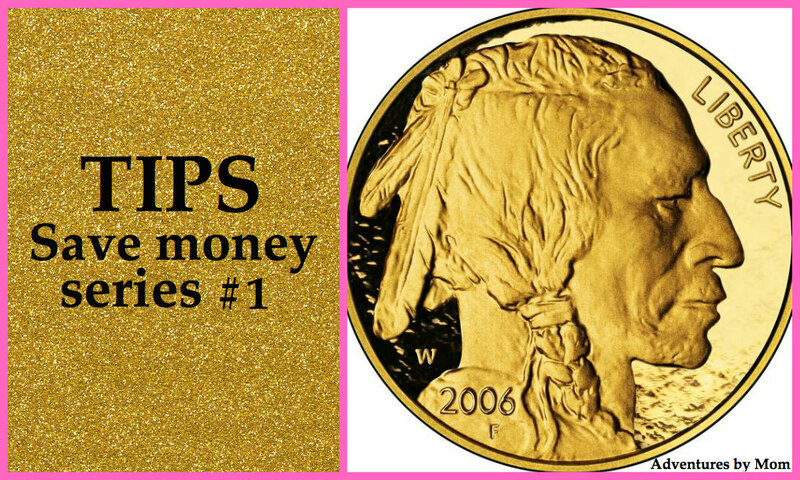 This is my favorite way to add money to my travel fund. I do things myself instead of paying someone else to do it! You can learn to do anything by watching youtube videos and you can start there. If I manage to do something myself, I put the amount of money I would have paid someone else into the travel fund. Dog grooming – I bathe the little one because she is small and manageable at only 8.5 pounds. The bigger, fluffier one isn’t worth the mess after a bath. I trim their nails myself and pay my $5 each time. Think about your strengths. What can you do and then pay yourself? 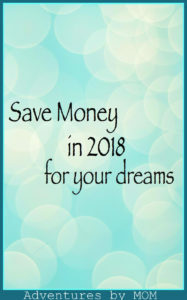 Take control of YOUR finances to save for YOUR dreams! We’d love to hear what you do to keep control of your savings. Give us your tips in the comments. We all have Adventures as a Mom. Being a mom is hard, right? Well, in case you are wondering if what you are going through is within a range of normal. . . From pregnancy, in all of its stages and glory to childbirth, from newborns to high school graduations there are so many things nobody tells you about. You may research and ask a million questions, but until you are in the thick of it, there are things you didn’t know you even needed to ask about. 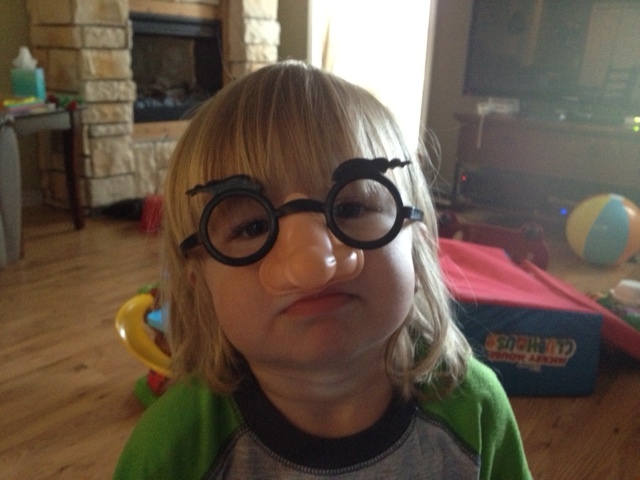 Being a mom IS hard, but it’s also the most rewarding, fun, tiresome, and never-ending job you will have. It’s a privilege some women work hard, and endure so much to have. No matter where you are as a mom, we are here with you. Moms of all ages and stages are invited to join us as we share our insights, advice, and wisdom about all things mom related. We all need a little support, encouragement, and advice from time to time. And we all need to remember to laugh and enjoy the small moments. So, grab a beverage of your choice and join us. Three moms, with different parenting styles and backgrounds, have joined forces to share their mom wisdom. From how to keep your family from starving, decorating your home for any occasion, making sure your child has a great education, relaxing and enjoying some down time, to staying sane while keeping it real – You are never alone in your adventures of being a mom. Who is that mystery boy?